Criminal Girls: Invite Only is probably one of the few games to hit North America that somehow combines things that could come straight out of Fifty Shade of Grey with your average, everyday dungeon crawler. It is a combination that makes this RPG very, well, strange, to say the least. The PlayStation Vita title starts players off right at the bottom of Hell. While that’s not exactly the best place to be, the player is right away informed that his or her character is only there temporarily, and that the player has a certain, special job to do. This job revolves around reforming a few girls who apparently have done things to deserve being in Hell, but can leave the awful place if they can be properly remade into model citizens. Four girls are handed over to the player, and it is mentioned that some other girls escaped. It becomes the player’s job to track these other girls down and reform them as well. The girls, of course, are all scantily clad, are wearing dog collars, and are deeply opposed to the reformation. Although each girl has her own distinct personality which clearly comes through in her dialogue, they all seem to agree that following the player around is a bad idea. In fact, the “criminal girls” are so opposed to the player’s character that even when monsters start popping up all around Hell and attacking people, the girls don’t have the motivation to defend themselves. Thus, it then falls on the player to “motivate” these girls with different items, such as a whip. Strangely, the only way to “motivate” them is by beating the “temptations” out of them with said whip. This prompts a little mini-game, in which the player has to use the touch screen to touch little icons that appear within a certain time limit. I should mention that while this is happening, an image of the girl in a deeply sexual pose appears in the background, and after the whole ordeal is finished, the girl will make a somewhat sexual comment. The whole thing is pretty uncomfortable, and is extremely offensive. It also, unfortunately, cannot be avoided, as this type of thing needs to happen in order to teach the girls new powers and skills, which can be used to fight monsters. 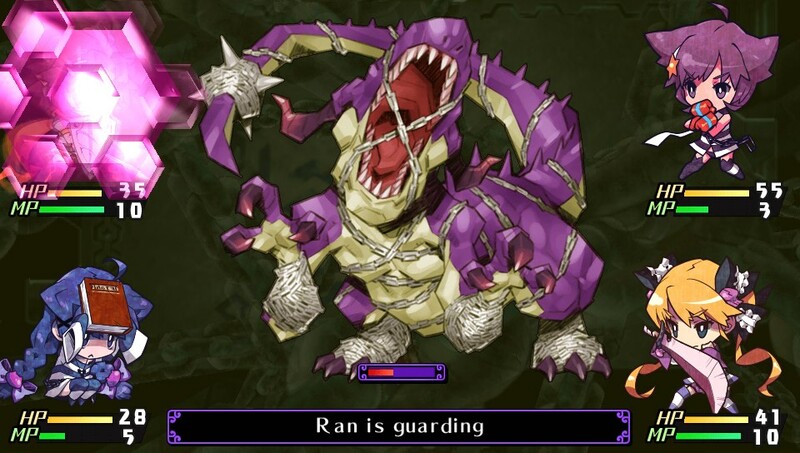 Unlike the “motivation” section of Criminal Girls, beating up monsters is neither offensive or uncomfortable; on the contrary, it is actually a blast. Like many dungeon crawlers, the player must progress through various stages while gathering loot and fighting off monsters, which pop up through random encounters. Each stage contains increasingly difficult enemies, and there are bosses, a few puzzles, and various environments that the player will encounter as well. However, the bulk of what anyone playing the game will be doing is fighting off the hundreds or thousands of random encounter baddies. As numerous JRPGs work, combat revolves around turn-based action. However, there are a couple catches. First — even though up to four girls can be in a player’s party, only one can attack each turn. This can be especially cruel at times, since enemy parties allow for each baddie to attack every turn. Second — the type of attack a girl uses (one that consumes magic points or a normal one) is random each turn. Players can choose which girl they want to use to attack and can see the attack she will use before selecting her, but are not able to change them. Both of these things put an emphasis on strategy, as the player has to carefully choose which enemy to attack and kill first, and both put an emphasis on leveling up. The only way to defeat certain monsters is to deal huge amounts of damage at once, and the only way to do that is by making sure your party members are a few levels ahead of your enemies, making it a good idea to wander around the lower stages for a lot longer than necessary in order to gather XP and potions before heading off to the higher and harder stages. As the stages progress, players will encounter various girls that will join the party. Each girl will have her own special skills, strengths, and weaknesses. Some will be able to use magic attacks that deal huge amounts of damage and take up large amounts of magic points, but their normal attacks will be weak. Other girls will have great normal attacks and health points, but a low number of magic points. The trick is to put together a well-balanced party and level up the girls so they will have powerful abilities and skills. With all of that in mind, I think I have to suggest to readers that they pass on Criminal Girls: Invite Only. While the combat is entertaining and the dungeon crawling is okay, the story and the whole idea of having to “motivate” these girls are simply too unnecessary, too uncomfortable, and too offensive for this game to be worth your time. Plenty of other JRPGs follow the same combat structure, and I think your money would be better spent checking some of those out.